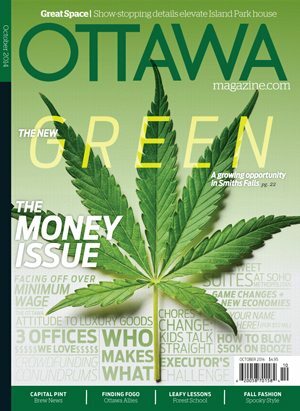 This issue’s cover image — the iconic marijuana leaf — was not intended to be the cover story. But as we dug into the subject of money, we found that the topics — currency and investments and the like — were, frankly, not very photogenic. a testament to the growth of web-based businesses. It seems Bitcoin could serve as an apt metaphor for our current relationship with money. The cyber currency has yet to really permeate our everyday lives, but it’s catching on. There’s an ATM-type machine in the ByWard Market that lets Bitcoin users withdraw from their accounts, and Jazz Fest offered it as an option for ticket purchases this past summer. On the other hand, there is something special about coins and paper money, even cheques — not only the artistry of the physical objects but also for all that they symbolize in the evolution of civilization. Will piggy banks and ink signatures survive in the digital age? We’re in uncertain times when it comes to Bitcoin: it could be the Next Big Thing or something we’re laughing about five years from now. But Bitcoin is definitely not cover-image material, and I think the marijuana leaf actually is a good representation of our economic future. Just 10 years ago, we would have scoffed at the idea of the government getting into the medical marijuana business. Times have changed. Justin Trudeau might be the politician openly discussing his post-dinner joints (for more on that, see “The Jester,” page 15), but it’s the Harper government that has ushered in a new — albeit controversial — openness about medical marijuana. No one could have guessed that, and no one can tell with any certainty what the next cash crop might be. So we’re having fun with our first Money Issue, mixing informational pieces with tongue-in-cheek humour, all in the name of bringing filthy lucre to the fore. Coming Up: Our big food feature returns in the Winter issue of Ottawa Magazine. This time around, we’re rounding up the best dishes in the city, turning the tables on chefs and restaurateurs, and looking at the big picture when it comes to dining out. It’s sure to leave even the most fervent foodie completely satisfied.